My pride and joy started life as a 2005 Night-train. 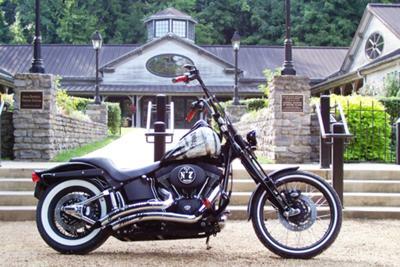 A nice bike to start with but I wanted something more than a normal Harley anyone can buy at a dealer. A trip to J&P cycles in Daytona Florida was the start of the transformation. They had a nice collection of Jack Daniels cover plates on display, since that is my beverage of choice it was an easy task of committing my bike to the task. The only parts I purchased for the project were the cover plates and a stripped down DNA Springer front fork set. Blackbeard cycles in Orlando Florida did the custom paint and the powdercoating of the front end, wheels, brackets, grips and pegs was done at Accurate Powdercoating in Titusville Florida I hope you enjoy the bike as much as I do. If anybody would like a couple of closeups send me an e-mail to lobo6935@bellsouth.net. In the subject box put JD bike closeups. The Bike looks great, but I wish we could get some close up pictures so we can see some of the detailed machine work that you've done. Great job.